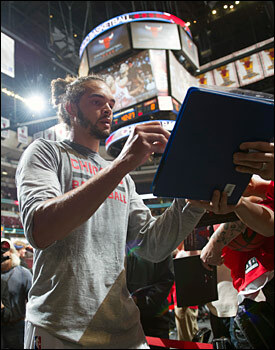 Last season, Noah appeared in 66 games, averaging 11.9 ppg, a team-high 11.1 rpg, 4.0 apg, 2.14 bpg, 1.18 spg and 36.8 mpg. Jimmy Butler, who missed Wednesday’s game with a left knee contusion, is a game-time decision for Friday’s matchup against the Pacers (7 p.m. CT | CSN-Chicago & NBA TV | ESPN 1000) after participating in parts of the shootaround. Derrick Rose, who returned to action Wednesday against Detroit after a one-game absence, is good to go against Indiana. As for Noah, who played 19:45 against the Pistons and hauled in eight rebounds, Thibodeau said his condition has improved, but his groin has not fully healed. “It’s better, but it’s not where we would like it to be,” said Thibodeau of Noah. “We want it completely healthy where he doesn’t feel it. “His feet are really good, so that’s a plus. Overall I thought his timing wasn’t great offensively, like it normally is, but defensively his reaction to the ball was terrific and his defense was outstanding, so that part is good. Noah’s absence will keep the team from having it’s starting five that also includes Rose, Butler, Luol Deng and Carlos Boozer on the floor together, but that’s something that hasn’t frustrated Thibodeau at all, given it has allowed him to look at different combinations and experimenting with players at different positions. “This is what you go through in a season,” remarked Thibodeau. While admittedly a great deal of attention has been surrounding Rose’s return, Thibodeau took a moment to highlight what goes into overall team improvement with the regular season opener just 11 days away.